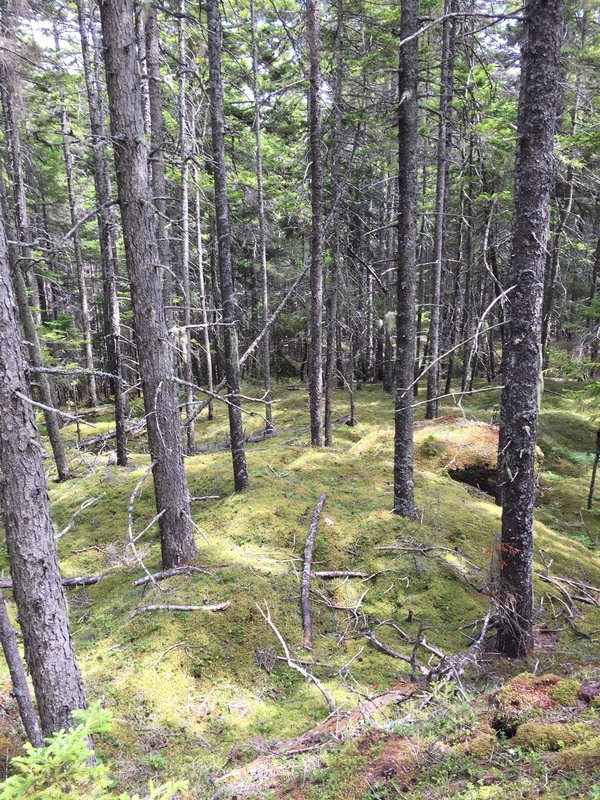 There are many good hiking trails on Deer Isle. 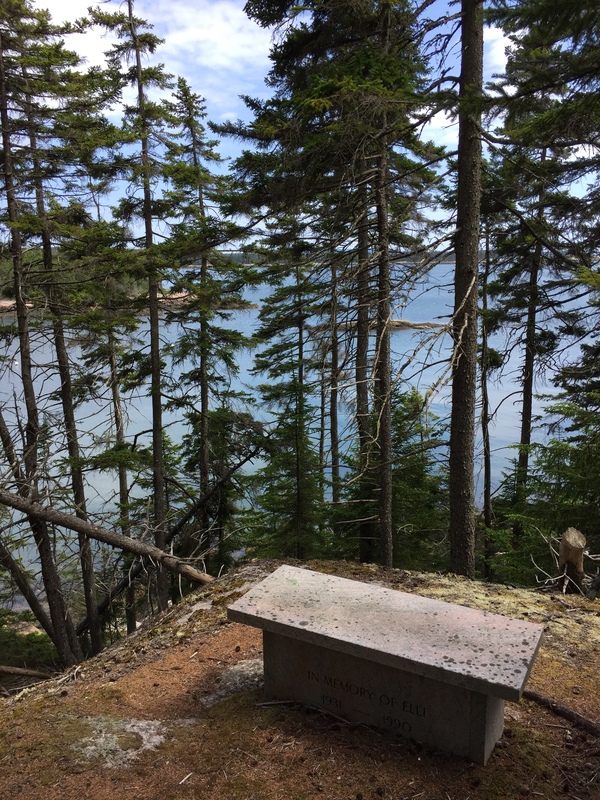 One of the nicest ones, maintained by the Nature Conservancy, is the trail that runs past Goose Cove to the Barred Island Preserve. It’s called Barred Island — I think — because when the tide is in Barred Island is an island, but when the tide is out a land bridge forms that allows you to get out on the island without getting your feet wet. You can see the spit of land that leads out to Barred Island in the photo above..
There’s just one problem: the trail out to Barred Island, which runs through a dense forest, is just about the rootiest trail you’re ever likely to encounter. That isn’t an issue for normal folks. 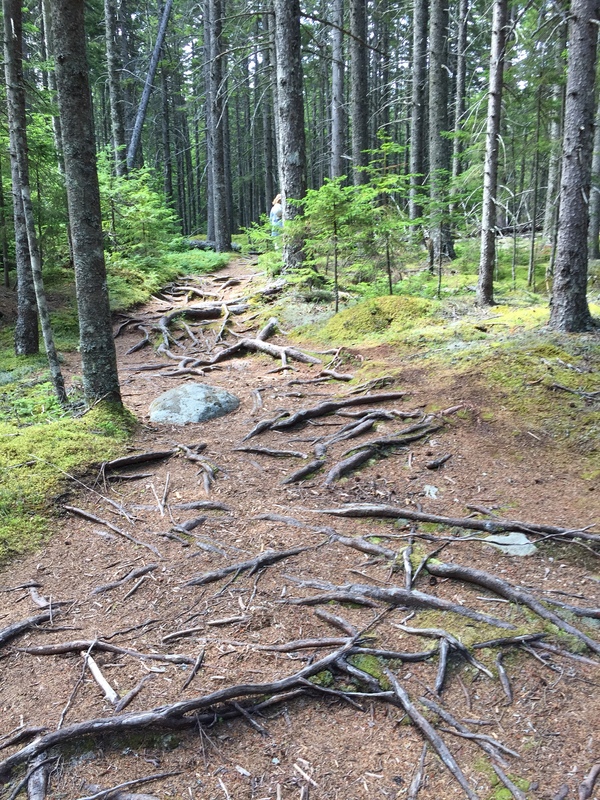 In fact, so many prior hikers have taken this route that the exposed roots are worn smooth by the tread of countless prior visitors. But if you’re a foot-dragging stumblebum like me, it means you’ve got to carefully watch where you are planting every size 12 shoe, to make sure that you’re not going to turn an ankle or do a face plant on the next root system. If you pause for a moment before you make the next careful step on the rooty route, though, you’ll realize that you’re in some of the nicest forest you’re likely to see. And . . . it’s so quiet! There’s not a sound to be heard, and if you’re walking on a day where there’s a gentle breeze, as was the case during our hike, not even insects will bother you. There’s so much pine straw on the ground that, except when you’re walking on the roots themselves, it’s like you’re walking on a plush natural carpet. As you approach the water, after a hike of about a mile, you begin to sense the salty ocean smell mingling with the overwhelming scent of pine. Finally you emerge onto a scenic overlook that allows you to see out onto the water and the islands that are far away. It’s a breathtaking view. Once you get out to the Barred Island and the bay, you’ll encounter a fabulous waterfront scene. 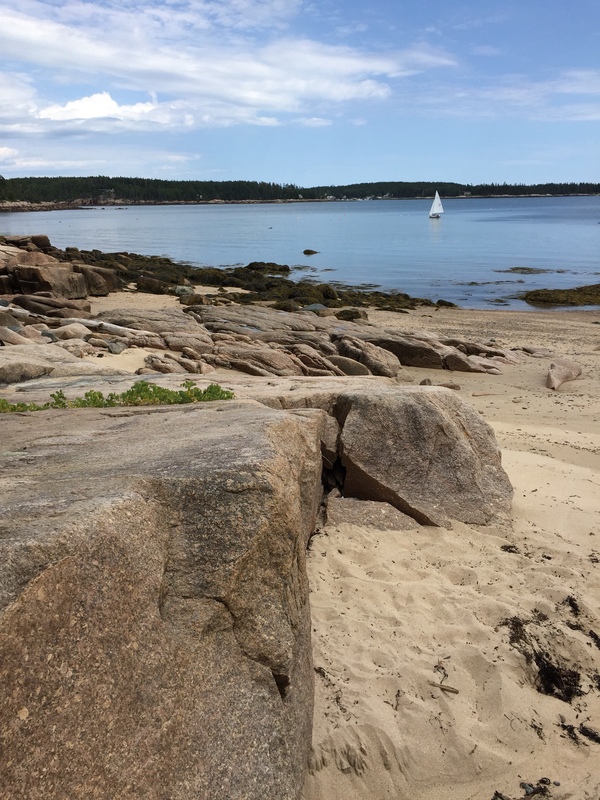 To the right, across a gritty, pebble-strewn beach, is Barred Island, and to the left are more of those colossal Maine granite boulders, many of them algae covered because they fall into an intertidal zone. And beyond that lies the sailboat-studded vista of the bay. On the way back, be sure to take the shoreline loop and the short detour to Prayer Rock. 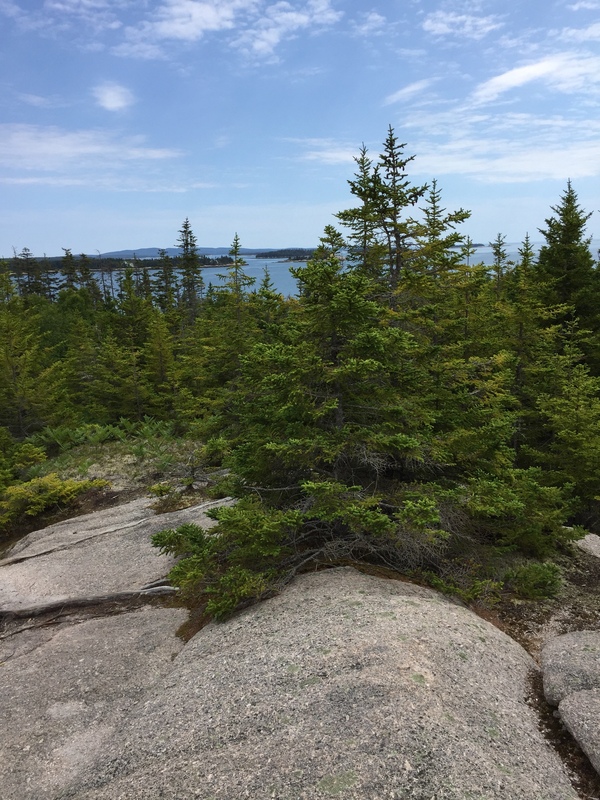 The path leads us up to a flat granite outcropping that is far above the cove and the bay, which can be seen through the ever-present pine trees. You’re not the first one to visit the promontory, of course — some thoughtful soul has built stone benches that are dedicated to some other people who loved this area and the beautiful view the Prayer Rock offers. Alas — it’s time to return, back over the rooty path to where you began. Watch your step, and be sure to hand that walking stick that you found to the next traveler who wants to enjoy the hike to Barred Island.